FOOTBALL: PROMOTION is still very much on the mind of Coventry United boss Terry Anderson, despite his side’s heartbreaking FA Vase defeat to Bromsgrove Sporting last week. 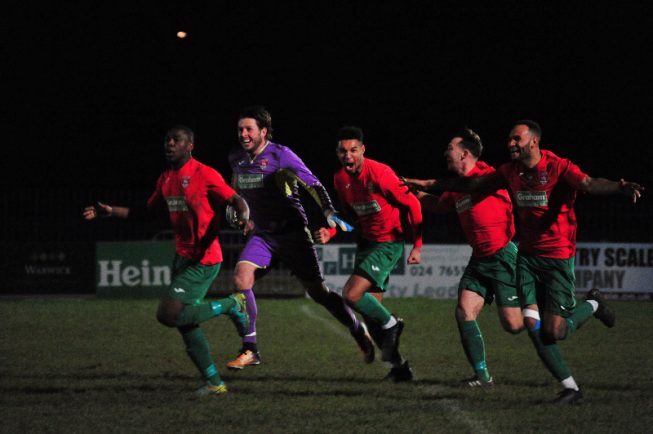 The United boss remains confident his side can push for promotion from the Midland Football League, and his men have every reason to optimistic about the future with a clean run of league games left for the remainder of the season. United sit 12 points short of table topping Sporting Khalsa, but have three games in hand. And with Khalsa set to take on second-placed Coleshill this weekend, Anderson senses an opportunity for his men to gain some ground of the league leaders. Speaking to Observer sports editor Shaun Reynolds, Anderson said his side has one aim only. “Our aim is to win the league,” said Anderson. “The players are in the team to win the league. We’re not happy finishing third, fourth or fifth. We need to go up. “We play six of the top teams in our next batch of games. If we can put a run together it will put us in good shape. “There’s still two thirds of the season left. Teams will drop points and fall away. If we’re still there around March and April time we can launch a challenge. “People keep saying to me this is the most competitive the league has ever been. The coming weeks could prove to be season defining for United. Games against inform Highgate, Coleshill, Heanor and city rivals Sphinx follow in the coming weeks. But Anderson insists his squad is ready for the challenge ahead, and hopes to land the signature of one or two players along the way. He said: “When a team is winning you like to keep the same team. But at the same time we don’t want to burn anyone out. “I think we’ve got a strong squad to get us through this period. “Pitches will poor. No one imagined we’d get weather like this. Our game on Saturday is touch and go, but it’s not looking good. “People want to watch football during the festive season so hopefully games can go ahead. “We’re working on a few things at the moment, hopefully a couple of them come off. One boost Anderson has at his disposal is being able to play at one of the most advanced stadium’s in the Midland League. The Butts Park Arena has been home to Coventry United since the start of this season, and Anderson hopes the partnership continues long into the future. “Playing at the Butts this year has been fantastic,” he said.